In August and September, 391 students attended individual graduation ceremonies in Adelaide, Melbourne and Sydney to receive their parchments from Le Cordon Bleu Culinary, Bachelor’s, and Master’s programmes. Twenty-three students received awards for outstanding achievement. 280 guests assembled at Adelaide Town Hall to celebrate the Adelaide graduation of Le Cordon Bleu students from Semester 1, 2017. Sixty-four students from Le Cordon Bleu Culinary, Bachelor’s, and Master’s programmes were eligible to receive parchments at the formal cocktail event, with 10 students honoured for outstanding achievement. Industry guest speaker, Olivia McFarlane, Le Cordon Bleu alumna (Bachelor of Business in International Hotel Management, 2014) and Front Office Supervisor at Hilton Hotels Worldwide delivered an engaging speech encouraging students to take advantage of every career opportunity. Le Cordon Bleu celebrated the achievements of graduating culinary students at Aerial in South Wharf with 70 guests, including students, staff, assessors, academics and industry partners. Forty-seven eligible students graduated from Le Cordon Bleu culinary programmes, with four awards for exceptional achievement. Master of Ceremonies, Mr Ken de Mallindine introduced industry guest speaker Lilli Franco, Senior Educator at Le Cordon Bleu Melbourne and Le Cordon Bleu Paris Alumna. Gabriele Villiger (graduating from Diplôme de Patisserie) was student guest speaker. Four students received Le Cordon Bleu awards in recognition of their exceptional achievements. 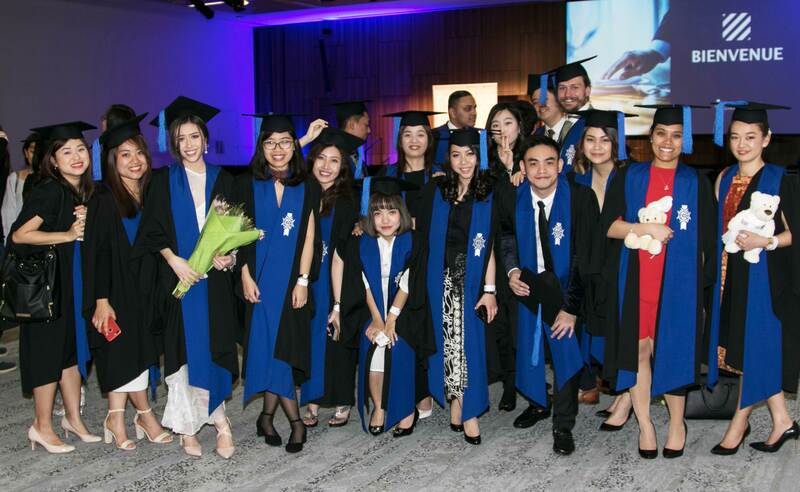 350 guests gathered at the International Convention Centre to attend Le Cordon Bleu Sydney’s graduation ceremony. Master of Ceremonies, Mr Philip Brown introduced industry guest speaker Fang-Wen (Mia) Tseng, 2IC to Executive Pastry Chef at Westin Sydney and alumna. Two hundred and eighty students graduated from Culinary and Bachelor’s programmes (Semester 1, 2017) with nine students awarded for outstanding achievement. Le Cordon Bleu congratulates all talented students graduating from our three institutes, who will continue their commitment to excellence as members of our global alumni network.